American robin photo by Radsaq on Flickr (noncommercial use permitted with attribution / share alike). 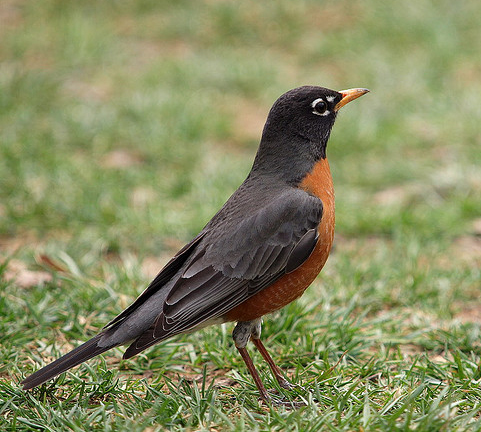 The American robin is the state bird of Connecticut, Wisconsin, and Michigan. Robins were named by early settlers after the familiar robin red-breast of Europe (a bird with similar markings that is not closely related to the American Robin). The most widespread thrush in North America (because of its adaptation to human-modified habitats), robins are a familiar backyard bird often observed pulling up earthworms on suburban lawns. Migratory robins are watched for each year as the heralder of spring, but many spend the entire winter in New England swamps, roosting in evergreens and feeding on winter berries. The American robin has many vocalizations; rich songs composed of long phrases and "whinny" and "tut" calls. The female is muted in color compared to the male robin. 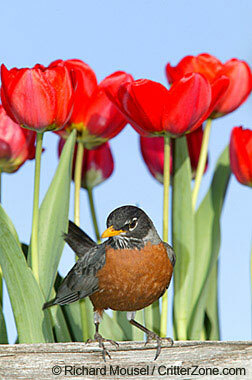 American robin in tulips; photo © Richard Mousel/CritterZone: Animal - Wildlife -Nature Stock Photography (all rights reserved; used by permission).